The scientific hypothesis that is radiocarbon dating initially encountered significant market resistance in academia because radiocarbon measurements had a nasty habit of contradicting the “known” dates associated with historical artefacts. This market resistance dissolved when academia established the Settled Science of radiocarbon calibration to enshrine their cherished “known” dates. Calibration is needed because the atmospheric 14C/12C ratio, which is a key element in calculating radiocarbon ages, has not been constant historically. Although Willard Libby, the inventor of radiocarbon dating, had pointed out as early as 1955 the possibility that the 14C/12C ratio might have varied over time, it was not until discrepancies began to accumulate between measured ages and known historical dates for artefacts that it became clear that a correction would need to be applied to radiocarbon ages to obtain calendar dates. Unfortunately, this sad tale from the Annals of Settled Science doesn’t mean the radiocarbon calibration process is valid or accurate. It just means radiocarbon calibration produces dates that academia accepts. The latest version of the mainstream consensus calibration curve that controls the radiocarbon calibration process was published in 2013. For example, the IntCal13 Northern Hemisphere Atmospheric Radiocarbon Calibration Curve details calibration data for every fifth calibrated year during the Current Era [CE]. Unfortunately, this doesn’t mean there is an entry for every measurement year or even every fifth measurement year. Note: click on images to view at higher resolution. From the perspective of the measurement year [labelled “14C Age CE”] the calibration curve is a very strange affair where [roughly] every 200 or 300 years time flips into reverse for about 50 years. This zigzagging in the calibration curve suggests there are serious issues. In the 2nd millennium CE one of the more curious aspects of the calibration curve is the strangely sparse measurement data during the Maunder Minimum. The Maunder Minimum, also known as the “prolonged sunspot minimum”, is the name used for the period starting in about 1645 and continuing to about 1715 when sunspots became exceedingly rare, as noted by solar observers of the time. Furthermore, this sparse data during the Maunder Minimum suggests there was no significant change measured in the Carbon-14 levels. This, in its turn, suggests there was no significant change in the flux of cosmic rays during the Maunder Minimum. The apparent rise in Carbon-14 values during the Maunder Minimum in the consensus calibration curve is purely a [long standing] calibration artefact. From the perspective of the measurement year [labelled “14C Age CE”] there are two worrisome data gaps in the 1st millennium CE. 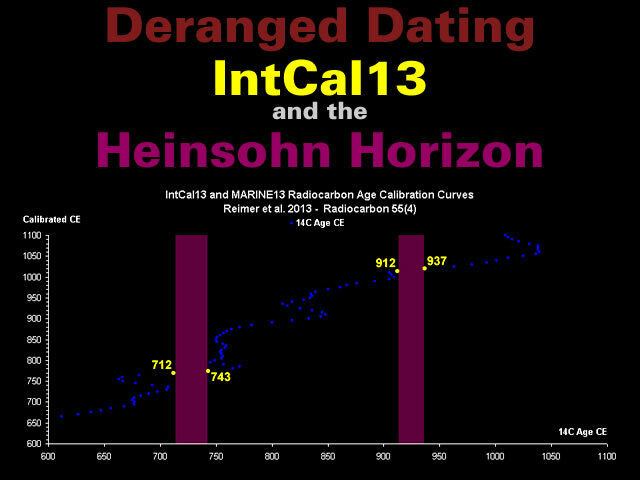 The smaller data gap beginning in 912 suggests the raw measurement year is precisely accurate at this point in the calibration curve because it aligns [to the year] with the Heinsohn Horizon as determined by the perihelion of Comet Halley. The larger data gap where the calibration curve restarts in 743 is very suggestive of the first felling of mature oak trees after the Arabian Horizon in 637. This interpretation of events is further reinforced by the observation that the pattern traced by the calibration curve during the first 712 years of the 1st millennium replicates the calibration curve pattern that ends around 1350. 1) History does in fact repeat itself. 2) It represents Gunnar Heinsohn’s 700 Phantom Years in the 1st millennium. The stratigraphy of Aachen, for example, illustrates Gunnar Heinsohn’s central theme that the mainstream has mistakenly populated 700 phantom years [in the 1st millennium] with Roman Architecture and Artefacts from Antiquity i.e. 1st – 3rd centuries. Gallery | This entry was posted in Arabian Horizon, Atmospheric Science, Catastrophism, Comets, Dendrochronology, Deranged Dating, Heinsohn Horizon, History, Maunder Minimum, Old Japanese Cedar Tree, Radiocarbon Dating. Bookmark the permalink. Well that’s unequivocal. Our dumb drendologists are simply following their false faith into the forests of their asinine academic artfulnesses. Z(To be uttered with a vacuous mind and repeated until automatic). When I see that Carbon 14 dating is calibrated according to an entire northern hemisphere and not differentiated regarding the physiology of different plants then I can see that no study has been done for carbon 14 like the one above regarding carbon 13, wherein the preferential treatment of carbon Isotopes is taken into account for different plants. And if it is true that plants preferentially exclude carbon-14 to a certain extent, like they do for carbon 13, according to their physiology and the specialization of their chlorophyll, animals who ingest these plants would likewise exhibit a preferential exclusion of certain isotopes of carbon. This would make plants and animals appear older than they really are. So until and unless a study and survey of all plants regarding carbon 14 assimilation is done then carbon 14 dating cannot be considered valid. C14 is another proxy, the be used with ‘due diligence’. This link: https://www.facebook.com/melitamegalithic/photos/a.753941334780674.1073741866.430211163820361/753941484780659/?type=3&theater is an example which shows C14 from IntCal13 compared to other known indicators to events, in that time range. C14 has its value in giving possible indication of the primary/causal source of events, including one that did not show up from elsewhere.